SYDNEY (AP) — Brandt Snedeker hasn’t played the Australian Open since 2007 but the memory of his costly mistake in the final round hasn’t faded. Snedeker lost by a shot to Craig Parry when he called a penalty on himself on the 14th hole of the final round at The Australian Golf Club because the ball moved as he tried to shift some twigs around it. 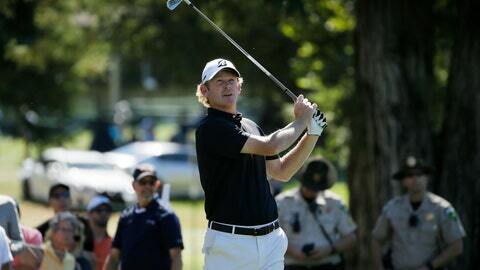 “It was a no-brainer penalty,” Snedeker said. A nine-time winner on the PGA Tour, Snedeker is joined by fellow Americans Matt Kuchar, who won last week’s PGA Tour event in Mexico, and Keegan Bradley in the field this week at The Lakes, just down the road from The Australian. Missing from the Open this year are two of Australia’s top players, Jason Day, whose wife is expecting a baby, and Adam Scott. Jordan Spieth, a two-time champion, has also decided not to travel Down Under this year, and the field is one of the weakest for the tournament in years. Geoff Ogilvy, who won the Australian Open at The Lakes in 2010, was quoted as saying in Golf Australia magazine that he’s disappointed the tournament, first played in 1904, isn’t what it was back in the days when Jack Nicklaus, Gary Player, Arnold Palmer and Greg Norman were adding their names to the Stonehaven Cup. The prize money of 1.25 million Australian dollars ($903,000) and A$225,000 ($163,000) to the winner this year can’t compete with other tournaments around the world. Ogilvy said the increasing investment in rival tours means players and sponsor money is going elsewhere. Kuchar on Wednesday said the Australian Open’s history, and not the prize money, is a reason he’s in Sydney. The Australian Open field should improve next year when it is moved to the week before the Presidents Cup at Royal Melbourne. The 2019 Open is scheduled Dec. 5-8 at The Australian. Traditionally, many of the top U.S. and International players in the Presidents Cup come to Australia a week early to get over jet lag and acclimatize to the Australian conditions. The Australian Open will be the first qualifying tournament for next year’s British Open at Royal Portrush, with the top three players not already exempt earning spots.